You can’t be missed wearing this tee. A true conversation piece that is edgy and fun! 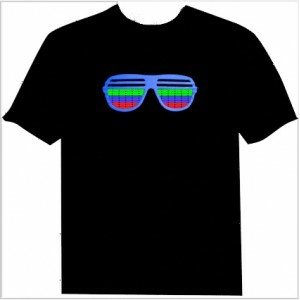 It’s called “light up tee.” Who would have thought to convert the L.A. Gear light- up sneaker into a t-shirt? Get ready for the nightlife, literally! These tees light up and some play music. If you ask me, this item is so Kanye in “Good Life” meets T-Pain in “Freeze.” The array of designs and colors available make this jersey shirt even more unique. From amplifier designs to skulls, and even iTunes’ icon designs, there is no way you can’t find a print that is perfect for you. I have not been able to locate these tees in stores. However, I found plenty of websites that have them in stock. Not everyone can fancy wearing a t-shirt that lights up and plays music. If you’re not into the futuristic fashion these shirts boldly represent, buy it as a gift for your space age enthused friend or family member.